Several weeks ago, we introduced our readers to the Springfield Armory Saint AR 5.56mm rifle. Today we’re taking a close look at the newest sibling, the Saint “Edge” AR pistol, and it is quite a firearm. Note: This is not to be confused with Springfield’s standard Saint AR pistol, which I will be reviewing in a couple of weeks. According to the Springfield Armory web site, the Edge AR pistol combines the most popular features of their premium Saint Edge AR rifle, with compact shootability in an AR pistol platform. This compact AR pistol, is everything Springfield claims it to be, and then some. We’ll take a look at some of these features. However be sure to check out their website for the full description and detailed specifications. One change from the standard Saint AR pistol we tested a few weeks ago, is that the Edge has a lightweight billet-machined lower receiver instead of a forged one. We also have the Springfield patent-pending full-length free floated handguard with a lightweight 10.3-inch barrel that is Melonite coated. It has a 1:8-inch twist, so it can handle not only light 5.56mm and .223 ammo, but also some of the heaviest weight bullets. The handguard is designed so you can attach M-LOK compatible accessories. 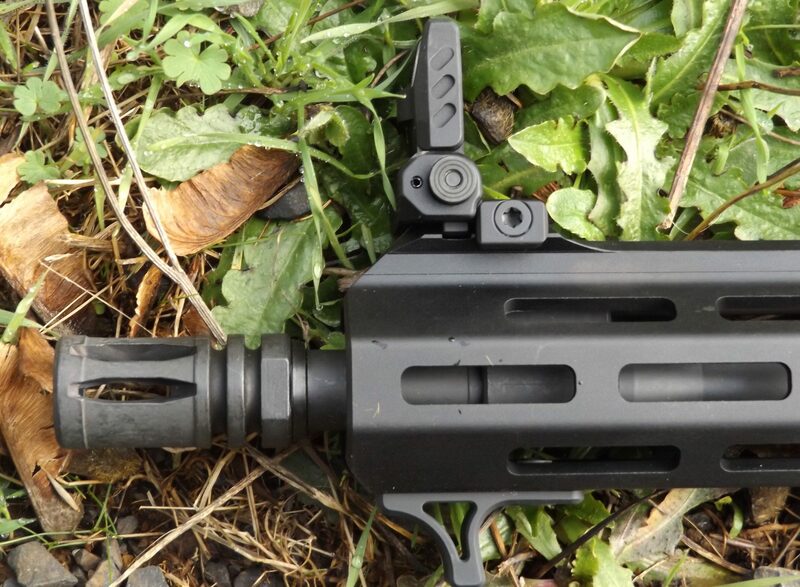 Unfortunately, I can see many users stupidly add as many accessories as they can fit on this handguard. This defeats the fast-handling capabilities of this pistol. I can attaching a see a small light, or perhaps a laser on the handguard, but that’s it. There is one salient feature I really love on the Edge, and that is the Maxim Defense CQB adjustable pistol arm brace. Keep in-mind, this ATF-approved arm brace is legally not a buttstock. The adjustability of this brace helps reduce the overall size of the pistol and helps reduce recoil and without a doubt aids in accuracy. With the arm brace extended, the Edge is 28.5-inches long. With the arm brace in the closed position, the pistol is 24.6-inches in length. The Saint Edge lower receiver has the Accu-Tite device, that keeps the upper and lower receivers held tight against one another – so there is no rattle when the gun is shaken, and is user adjustable. The lower also contains one of the best features on this pistol, and that is the crisp, match-grade, single-stage short rest trigger. This is basically a competition grade trigger in a tactical firearm. On my sample, the trigger breaks cleanly, right at 3-lbs – double and triple taps are a cinch with this trigger, and you can easily feel the reset on the trigger when you release it. The upper receiver has a forward assist as well as M4 feed ramps. Those are things that many lesser ARs lack. The M4 feed ramps make for smoother feeding and less malfunctions during feeding, from the MagPul PMAG 30-round magazine that is supplied with the gun. The M16 enhanced bolt carrier group is finished with Melonite and there is a 9310 HPT/MPI steel bolt, that is much better than any mil-spec group. 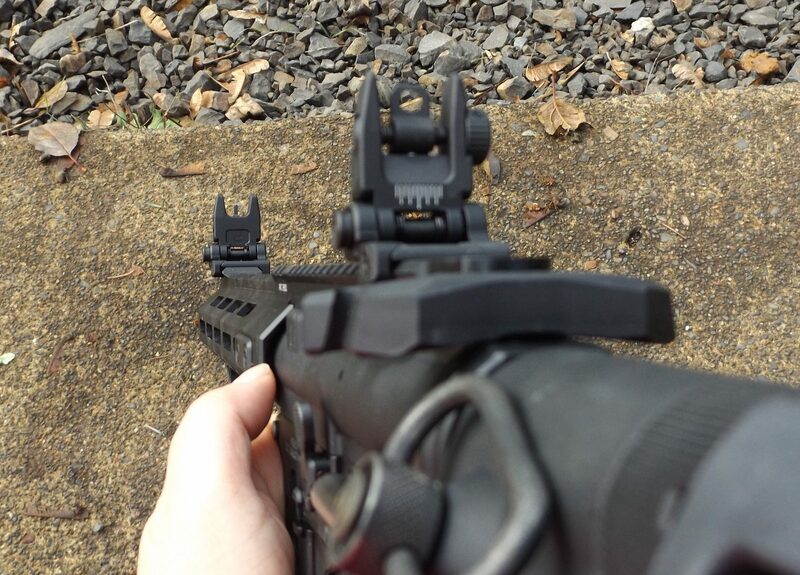 The charging handle is unique and is an exclusive to Springfield – it is a mid-sized design for enhanced operation, yet not easy to get snagged on clothing or equipment. There is an aluminum hand stop on the under side of the handguard of the Saint Edge, to prevent your hand from going in front of the muzzle of the gun, where you could otherwise easily lose some fingers. The Saint Edge has a standard M4 flash suppressor, unlike the standard SAINT AR Pistol–that has the blast diverter. Under the handguard you will find a large carbine length, multi-mode adjustable gas block. Yes, this is still a Direct Gas Impingement (DGI) set-up. However this system is user adjustable, so you can tune the gun for use with a sound suppressor or different ammo. It comes with a t-shaped hex key, for adjusting the amount of gas being used, and it also has another metering jet – according to the owner’s manual, it should have come with 4 of these metering jets – mine only had one. I sent an e-mail to Springfield, and was told that, after extensive testing, you really only needed the one metering jet – used for suppressor work, and that every ammo they tested with the installed metering jet – the gun operated 100% of the time. You’ll find an outstanding set of fold down/flip up sights on the upper receiver, so that saves you a bundle of money – and they are rock solid when folded down or flipped up for use, and give a great sight picture. Both the front and rear sights are ½-inch MOA adjustable. The sights can be folded down when optics are used – I plan on installing a quality red dot sight on my sample – a red dot that will allow me to co-witness the sights through the viewing window. Should the red dot sight go down or break, I can flip up the sights and look through them – through the red dot window, without having to take the time to remove the red dot sight. The Saint Edge weighs in at 5-lbs, 11.5 oz, so it is actually a little bit heavier than its older sibling, the Saint AR Pistol. However, it balances better and hence to me it feels like it weighs less. Way to go, Springfield! Be sure to check out the Springfield web site, for more details on some of the features on this dandy pistol. As already mentioned, the trigger pull – it is competition grade if you ask me. Mine breaks right at 3-lbs – very crisp, and a positive reset. This makes double and triple taps a cinch to perform on target. You honestly have to feel the trigger pull to understand how nice it is. The two fellows who own the gun shop I haunt were blown away with the trigger pull, and both said that they were more than ready to purchase my sample if I didn’t. But, no, I’m buying it! The Saint Edge is very fast handling. With a single point sling attached, you don’t hardly know you’re packing it across your chest or slung over your back. This is a great CQB pistol for home defense, or for law enforcement use in close quarters – a full-sized M16 or even an M4 carbine can’t compare to how easy it is to move through a building with this little pistol. BTW, there is an ambidextrous safety on the Edge. I can do without it myself. I might replace it later on with a single side safety. The Maxim Defense CQB adjustable pistol arm brace is the next feature that everyone raved about. We are talking super-rugged, no worries about dropping this pistol and the adjustable solid steel tubes bending or breaking. When fully extended – the way I’d use it – shouldered in a “incidental, sporadic, or situational” way, you have a rock-solid shooting platform, for enhanced accuracy. A sling swivel was added, and a single point sling attached. I have more than enough volunteer testers to help me with this shooting test. However, due to nasty weather, only two were brave enough to handle the elements. In all, we fired 1,000-rds through this gun, over several shooting sessions. Normally, I’d fire a lot less ammo, but the kind folks at Black Hills Ammunition sent me an outstanding supply of various .223 Rem ammo for this article, so the shooting started – and as a matter of fact, after the 1,000-rds we shot, I continue to shoot this outstanding little AR pistol. From Black Hills Ammunition, I had the following .223 Rem ammo on-hand: 40-gr Hornady V-Max, 52-gr Match Hollow Point, 55-gr FMJ, 60-gr Soft Point, 60-gr Hornady V-Max, 69-gr Sierra Matchking, 75-gr Heavy Match Hollow Point, 77-gr Sierra Matchking Hollow Point. Accuracy testing was conducted at 25 yards, with the pistol’s handguard resting on a rolled-up sleeping bag, over the hood of my pick-up truck. However, we had plenty of targets of opportunity to shoot at – large rocks were turned into smaller rocks, downed and rotting trees were turned into mulch, too. Large rocks out to 100-yards were no problem at all. With the short barrel, I believe 300-350 yards is about the maximum range for this pistol. And of course, bullet velocity is reduced because of the short barrel. Still, anything out to those distances, would sure wish they were someplace else causing problems – not a doubt in my mind. Many people believe shorter barrels are less accurate, but that is not the case. Most of the time, they are just as accurate and sometimes even more accurate, because they are very rigid. All ammo easily produced groups of under an inch, without much trouble. Then again, I didn’t expect anything less. There were several winners, that produced groups of ¾ of an inch – one that surprised me was the 40-gr Hornady V-Max, and the other was the much heavier 75-gr Match Hollow Point – hot on its heels was the 77-gr Sierra Matchking Hollow Point. There were no bad groups, and I shot a lot of groups. This gun is just plain fun to shoot. I’d give it a 10 out of 10 when it comes to fun. So would everyone else who was with me, when we tested it. Now, the dry statistics on this AR pistol simply don’t tell the entire story. You have to hold this gun in your hands, to really appreciate how it feels, and how fast handling it is. Double and even triple taps on human-sized targets were a piece of cake out to 25 yards – with the rounds punching the paper very close to one another. The trigger – you have to squeeze it, to fully appreciate it. Is that its best feature? It comes down to a dead tie – between the trigger pull and the Maxim Defense CQB adjustable arm brace. One feature complimented the other. Let me put this in some perspective, if I had a lot of AR rifles and/or pistols, and for whatever reason, I were only allowed to keep one of them, the Springfield Armory Saint Edge AR pistol would be my first choice – I love it that much. I don’t see myself on a SWAT team again, or in the military – doing house-to-house searches. But if I did, the Edge AR pistol would be my choice. Out on the battlefield – I’d also select the Edge. Well, maybe in the mountains of Afghanistan, where shots would be beyond 400 yards, I’d opt for something with a longer barrel. But I don’t see myself in these situations. In a survival situation, where I’m protecting myself and my homestead, or out patrolling my area, the Edge would be my first choice. Standing guard in the middle of the night, in the middle of no place – yep, the Edge pistol would be with me. Also perhaps a Glock 9mm handgun of some type on my hip – who knows? Now, here’s the news on the price, the Saint Edge retails for $1,559 – and that’s a lot of money, no matter how you look at it. However, and this is a big however, this is the only gun that I’d be willing to pay more than full retail for. It is worth every red cent they are asking for, and then some. My wife loves shooting the Edge AR pistol, and “indicated” to me that, she’d love to have one. Nope, sorry my love, don’t have the funds to get a second one. My wife is hard to please, when it comes to firearms, and rarely asks for anything new these days, so that tells me a lot about this gun. Check one out at your local gun shop – if you can find one in-stock. I expect we’ll see this gun offered in .300 Blackout very soon, too. Thanks for the review! It is on my list to check out. Thank God I live in a constitutional state where all guns are legal. With the Democrats in session in DC, it might be wise to buy one sooner than later. I’m impressed with this article, great job! I’ve also read other reviews that are just as complimentary therefore I’ve got one coming! They are not cheap but I’ve found you get what you pay for normally! Good as long as the BATFE doesn’t change their minds YET AGAIN! I built 2 AR pistols. One in 5.56 and one .300 Blackout. I also agree they are handy as all get out. Compact and quick to shoulder. I prefer compact weapons. None of my rifles have barrels over 18 inches, most less. So I see why you love this thing. It is cool. Every red blooded American should have at least one gun with its barrel over 18 inches. I’m referring to a .50 cal. One of its bullet cracks engine blocks, snipes accurately to over a mile, and can shoot through six 1/2 inch steel body armor plates. Don’t “shoulder” it….or you may be a FELON! (based on latest BATFE opinions). What a load of malarkey! Mala Prohibita at it’s finest! i did not see a place to comment further up the page, but I wanted to say a few words about the SurvivalBlog reference archive memory stick. I bought one last time, and it is all that you claim and more ! It has a very high quality waterproof metal case and can be attached to a lanyard or key ring. 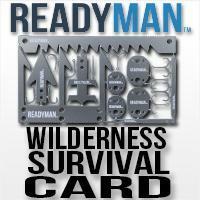 It contains a fantastic amount of reference material in a handy, durable, and portable form to take EDC. I also noticed that it had some spare room on it- enough for all of my contact information and some other files which I took advantage of. Super high quality product ! I just bought another one. Thank you. Have wondered how the forearm brace works, when used as intended, for dog handlers and others that may only have one hand free. Anybody had any experience, comments about products that worked particularly well or poorly in that scenario? Great review Pat! Looks like a nice setup but I don’t know that I could bring myself to purchase a Springfield Armory product after some of their anti second amendment shenanigans. The Springfield Armory backed Illinois Dealer Licensing Act went into effect Jan. 18. It will put a lot of mostly small dealers out of business which is the reason for the bill.